Experience a spectacular evening pageant of music and military precision drill, including horses, cannon and fireworks. A great one to enjoy with family and friends! This event is open to Liverymen, Freemen & Guests. We are currently holding 30 tickets at £35 each. We will also be arranging supper somewhere local beforehand. Reserve your places today with The Clerk. Deadline for bookings end of March 2019. These annual concerts are performed on Horse Guards Parade in front of the beautiful backdrop of St James’s Park each year on the Wednesday and Thursday evenings preceding the Queen’s Birthday Parade, or “Trooping The Colour” as it is often called. Military Beating Retreat concerts have a long tradition dating back to the 1690s. 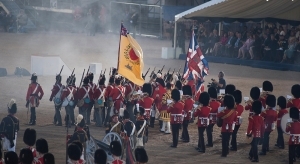 Originally the beating of the drum was used to order troops to break off fighting and withdraw to the safety of camp as darkness fell, later it signalled the closing of the camp gates at the end of the day and called troops back to base for the night. Today a Beating Retreat is an evening military concert with a marching display and usually marks the lowering of the Regimental flag at sunset. Soldiers of the Household Division are instantly recognisable through their distinctive uniforms and headdress and have a history spanning over three centuries. Invariably described as ‘truly spectacular’ and ‘London at its finest’ the Household Division Beating Retreat cannot be seen anywhere else in the world and is a not to be missed event.